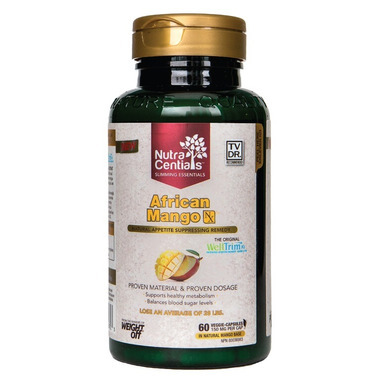 NutraCentials Slimming Essentials African Mango NX has WellTrim iG. 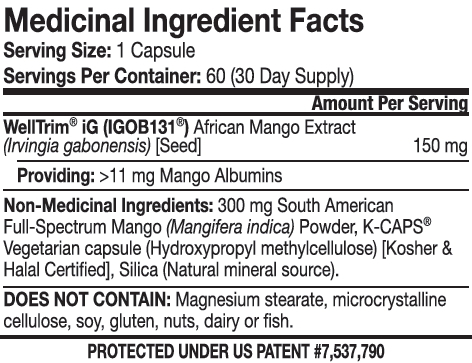 WellTrim iG (IGOB131®) is known as ‘The original African mango extract’ and is the only clinically-proven, certified authentic African Mango protected under US Patent #7,537,790. Mango is a source of antioxidants for the maintenance of good health. NutraCentials Slimming Essentials African Mango NX can help you lose weight as part of a healthy diet and exercise plan. In a published 10 week double-blind, placebo-controlled clinical trial, human subjects taking WellTrim iG lost an average of 28 pounds (1800% more weight-loss than placebo), reduced their waistlines by 6.8%, and reduced their body-fat by 6.3%, all without having to change their lifestyles. Recommended Use & Purpose: Helps promote weight loss. Recommended Dosage & Directions: Take 1 capsule twice daily (total of 300 mg) before your two largest meals with a glass of water. For best results combine with healthy eating habits and an active lifestyle.